Although the greater Telluride region is a place of diverse landscape and character, the community itself comes together on ball fields, ice rinks, at an array of restaurants and bars, and on the slopes. Faces become familiar and children and dogs roam free-range. Neighbors greet neighbors at movie venues, school auditoriums and even under tents to enjoy dance, theater, and song. There is a small town sensibility that presides alongside a desire to explore culture from all over the globe. The towns and mesas of this slice of southwestern Colorado are distinct and independent. But the people who settle here are bound by a real, live community and by the mountains that draw them all home. The short answer you'll get from local residents is that there are about 2,500 people in Telluride, but in reality the community stretches for beyond Town boundaries. Adding in the fast growing local population of the town of Mountain Village (an approximate 1,000), plus the residents living on the mesas and valleys beyond, the actual count of people connected as a community is probably well more than double that number. In addition, part-time residents and festival and ski crowds expand the ranks well into five digits, making Telluride feel bustling nearly year-round. Still, the local population is just a fraction of other Colorado ski towns like Steamboat Springs, Aspen or Vail, helping the area to retain a true community feel. 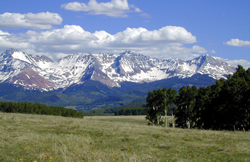 Southwestern Colorado is a web of small ranching, farming and resort communities. Towns that have strong ties to the Telluride community include Ophir, Rico, Ridgway, Norwood and the towns of Sawpit and Placerville that lie down valley from Telluride. Larger cities and towns located in the one- to six-hour drive radius from Telluride include Aspen, Grand Junction, Montrose and Durango in Colorado; Moab, Utah, the gateway to Arches and Canyonlands National Parks; Albuquerque and Santa Fe to the south in New Mexico; and Arizona’s high desert centers, Sedona and Flagstaff. On a map, Telluride looks remote, but it’s actually an excellent base for exploring a scenic slice of the Western U.S., from the ridges of the Continental Divide to the stark beauty of the desert southwest. 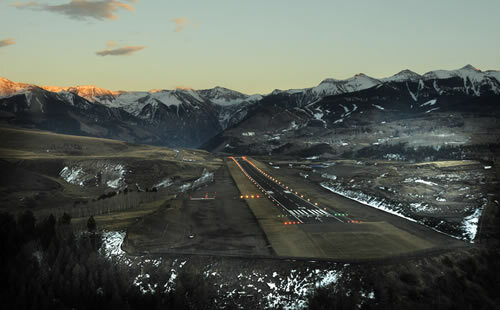 You can fly directly into the extensively-improved Telluride Airport. The unparalleled landing will reel you in over the tops of the peaks that encircle the Telluride valley before setting you down among some of the region’s finest views – this is, after all, the highest commercial airport in the country. And the take-off is equally as breathtaking, soaring off the cliff-edge runway into the great wide open. Though a Telluride flight is one you’ll never forget, locals also frequent the Montrose Regional Airport, a scenic 65-mile drive away. The airport in Montrose boasts a number of nonstop flights across the country, including to and from Atlanta, Chicago, Houston, Dallas, Los Angeles, Denver and Newark, making it a desirable landing pad for residents and travelers. The Telluride airport offers nonstop flights from Denver and Phoenix, as well as charter flights from several private companies. Ah, to be a kid in Telluride… with a summer academy that has four-year-olds putting up tents in the backcountry, and a winter program that puts the same kids on snowboards, skis or ice skates for gym class. And, in the meantime, a fine education is paramount, fueled by low classroom sizes and excellent teachers. The Telluride R-1 School District, which is consistently recognized by the state for its excellence, serves more than 585 students from the region, with a staff of more than 80 full-time and part-time professionals. 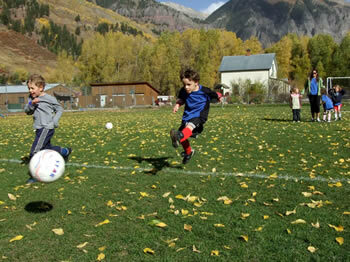 Elementary children spend their days at the historic brick school building located near the center of town, and high school, middle school, and upper elementary students are organized in pods at the newer multi-grade school at the entrance to Telluride. The Telluride region is also home to a fully independent pre-K through 10 accredited school, the Telluride Mountain School, which includes a Montessori preschool program. Additionally, the community hosts several preschool and daycare programs. Located on Pacific Avenue, the Medical Center has come of age through a series of improvements, to provide full emergency care around the clock. There’s no hospital in Telluride – the closest are in Montrose, Durango and Grand Junction – but the region can boast a nationally-acclaimed search and rescue team and local ambulance emergency crews that pull together some of the best and brightest of the community, including professionals and trained volunteers. Unlike other Colorado resorts, Telluride’s gondola, which climbs and descends the front face of the ski resort, is free. No money changes hands as you board with your bike, skis, even your dog for a trip between the towns of Telluride and Mountain Village. Locals use it to get to work, children use it to get to school and skiers use it to access the slopes. The gondola is a one-of-a-kind transportation link that is owned and operated by the Mountain Village metropolitan District – think of it as a bus with a spectacular view. 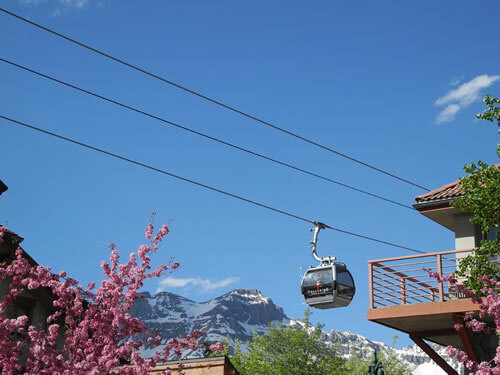 Traveling from Telluride, the gondola makes three stops: the first is on the ridgeline atop the ski area, the next stop is Mountain Village Core – the commercial center of the town – and from there, the gondola swings over the Mountain Village Core to access a multi-level parking structure. 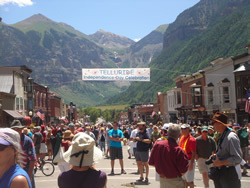 It’s been said, maybe once or twice, that Telluride is a town that knows how to throw a party. Following the lull of off-season, which officially begins when the lifts close in early April, the community ramps up for the summer-long weekend festivals, which can temporarily double, triple, and quadruple the number of people recreating in the box canyon. The Telluride Mountainfilm Festival opens the summer on Memorial Day weekend and the Blues & Brews Festival winds it down with one last hurrah in September. In between, is a list of festivals that have grown so prized they can be ticked off by only a word: Bluegrass, Wine, Jazz, Mushroom, Chamber, and Film. 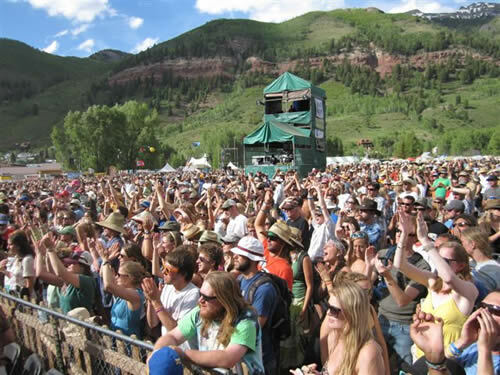 Telluride’s summer calendar is so packed that long ago a sacred mid-summer weekend was set aside for the official Nothing Festival. Everyone is advised to do, well, nothing. Elk and deer are plentiful here and can be spotted feeding in herds near the side of the highways, particularly at dawn and dusk. 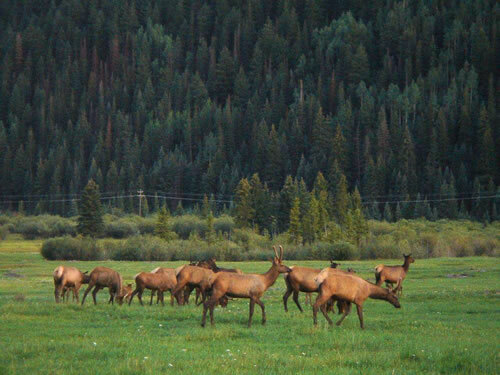 Elk herds can be quite large, with numbers reaching to 200 animals. Marmots are ubiquitous in the regional high country and can be seen sunning on the rock piles where they make their homes or heard with their unique high-pitch squeals, hence the nickname “whistling pig.” Coyotes can be seen slinking off to the sides of valley roads and mountain lions, though extremely elusive, also make their homes in the region. A smaller cat, the lynx, has made a comeback in the high reaches of the backcountry in recent years thanks to a successful reintroduction program by the state. And then there are the black bears; nearly everyone has a favorite run-in story as a result of the bears’ insatiable appetite for people food. As for feathered friends, there are many, including ptarmigans, grouse, and pheasants, as well as hawks, gray jays, Stellar’s jays and eagles. Beavers have made a comeback, and have the run of the large pond near Telluride’s Town Park, called, of course, the Beaver Pond. Seldom seen themselves, the remnants of the beavers’ nighttime work – gnawed tree stumps – are easily identified along the banks of tributaries. Look closely along waterways for the rare great blue heron or for smaller species like hummingbirds, butterflies and dragonflies; or peer into pools along riverbanks for a flash of a rainbow trout. The Telluride Ski Resort is alternately referred to as “the most beautiful place you’ll ever ski.” Yes, it’s unique because of its out-your-front-door access from both the historic town of Telluride and the contemporary Mountain Village. And, yes, it’s well known for its newly expanded advanced/expert terrain, which is challenging and exhilarating all at the same time. But what you may not know is that Telluride’s slopes and lifts remain un-crowded throughout the ski season, so you really can enjoy yourself. The Telluride ski experience also offers a genuine mountain experience for all levels of skiers, thanks to a variety of terrain at all points of the mountain. Averaging more than 300 inches of snow per year and 300 days of sunshine per year, odds are you will find fantastic conditions on the 2,000+ skiable acres, 125 total trails, a 4,525 foot vertical drop and 18 lifts, as well as summer activities of hiking, mountain biking and golf. 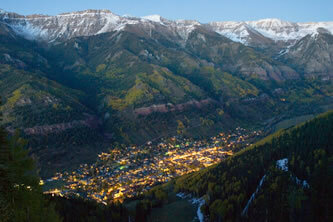 The Telluride Ski Resort is truly world class. In a catch-phrase adapted from its winter sibling, the Telluride Golf Club is commonly referred to as “the most beautiful place you’ll ever tee.” Undoubtedly true, as the 18-hole, 6,719-yard, par 70 course is surrounded by a peak-studded horizon from its 9,300 foot perch atop Turkey Creek Mesa. Many even go as far as to say it’s like playing golf in a post card. In addition to aesthetics, the course is one of the country’s highest in elevation, meaning the average golfer can drive an estimated 15-25 percent farther than at a lowlander course. Why? Same reason it’s tougher to breathe… the thin mountain air holds less oxygen and therefore imposes less resistance on the ball. Keep that thin air in mind when out on the green as the links-style course winds through challenging terrain and elevation changes. 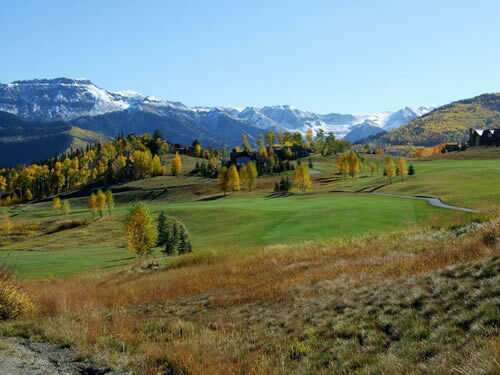 The Telluride golf course meanders from the back door of The Peaks, a Grand Heritage Resort & Spa, where the pro shop is located, to Mountain Village’s entrance and back again. Well, there’s the obvious: ice skating in both Telluride and Mountain Village, snowshoeing, classic Nordic and skate skiing, après-ski cocktails, a vibrant regional restaurant scene and plenty of shopping in both towns. And don’t forget the many local spas, where patrons are treated to everything from massages to facials to manicures. But then there are the unexpected pleasures: browsing through the comfortable expanse of the Wilkinson Public Library; strolling through the fascinating exhibits at the Telluride Historical Museum, which include numerous artifacts and relics from the region’s mining past; jumping in the car for a mini trip to the hot springs or warm outdoor pool in Ouray; or grabbing a ticket for one of the winter season’s stylish galas, concerts or fundraisers. Also, nearly every week during the winter season there is a head-spinning combination of classic films, choral and theater performances, art openings, special music guests and other cultural events.